San Antonio Stained Glass can both repair existing antique stained glass windows as well as create new windows that replicate antique styles. Older San Antonio homes often have a few pieces of antique stained glass near the front entry, in hallways and stairwells, as well as dining rooms and studies. Many of these stained glass windows are built in the Art Nouveau, Art Deco, Prairie, or Tiffany’s styles. We can work with home owners to undertake the process of restoring the original window, or if it is already too far gone, we’d be happy to build a brand new installation. Restoring the antique stained glass consists of two separate procedures. First, the glass is cleaned to remove the decades or centuries of dirt, grime, grease, and other particulates that have accumulated on the windows. Then, the leading is evaluated and repaired to ensure that the glass pieces are being held securely in place and limit the impact of the elements on the window in the future. 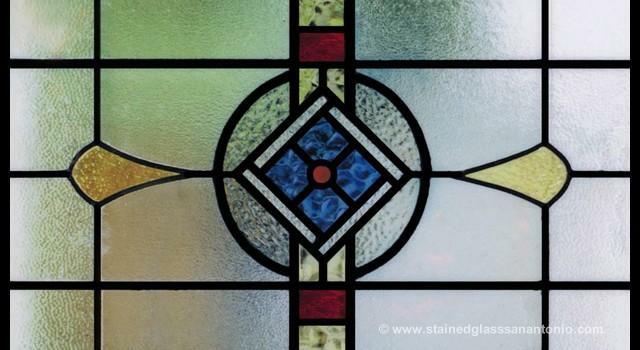 Building new stained glass involves either replicating the exact design which might previously have filled a window, or researching the age and style of the home to ensure that we are crafting a window that is of the appropriate style. In most cases these antique stained glass windows are characterized by bright colors and geometric patters that mimic elements of nature. Flowers, leaves, birds, and butterfly’s are common in this windows but we can create an antique designs that include any elements you may want in your glass.